I have been anxiously following the catastrophic flooding in Colorado since yesterday morning (September 12), appalled at the record-shattering rainfall and scenes of out-of-control water and devastation in my old stomping ground. In 2006 my husband and I moved to north Idaho after fifteen years in Broomfield, Colorado, just southeast of Boulder, and our grown children and their families still live in the Denver metro area. All are safe, thankfully, and we hope the best for our friends and colleagues, especially those in the path of danger. This demonstration of nature’s wrath raises my awareness of our vulnerability on the planet. Some places – including low profile atolls like Wake Island – are more vulnerable than others. I am intimately familiar with the streams, canyons, and steep slopes of Colorado’s Front Range and the high country behind, having hiked and explored much of the area over the years. The creeks and rivers rise every spring with the snow melt and some years the high dams spill over in long trickles, but everything generally balances out in breathtaking beauty. It’s been easy to glance over the signs along the canyon roads that warn: in case of flash flood seek high ground immediately, just as people ignore the tsunami evacuation route signs in the little towns along the Oregon coast. The wake-up calls come fast and hard. Flooding, earthquakes, and catastrophic storms have a tendency to recur in blocks of time, but not to the point of predictability. A horrific flood and mudslide swept through Manitou Springs below Pikes Peak in early August this year, the product of heavy rainfall and recent wildfire scaring, a pairing that carries great risk in Colorado. The deadliest recorded flash flood event in Colorado’s Front Range was in July of 1976 when a foot of rain fell in four hours in the high country and the Big Thompson roared down its canyon, killing nearly 150 people. The rain that fell over Colorado the last week was unrelenting, filling every ditch and drainage and sweeping up everything in its path. 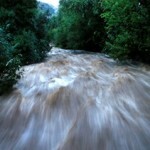 Yesterday a journalist reported that the rainfall that fell that day equaled half Colorado’s annual average. If that rain had fallen as snow, it would have been ten feet. Rain can fall in buckets on Wake Island as anyone who has spent any time there can tell you. In 1941 my grandfather Harry Olson wrote letters from Wake stating that they captured hundreds of thousands of gallons of rainwater (essential fresh water) during some storms. On Wake there are certainly no steep slopes, canyons, or even shallow ditches for water to gather and swell, posing danger to those downstream: Wake is as flat as a pancake and about as big: its highest point is maybe twenty feet with most of it not much more than sea level. The vulnerability there derives from the surrounding sea. In the long term, global warming will raise the seas and sink the atoll. As long as the Pacific generates weather monster typhoons will continue to sweep through with no regard to whether it’s there or not. I opened Building for War with such a typhoon hitting Wake Island on October 19, 1940, with 140 mph winds and ten-foot waves, a “furious marriage of wind and water.” According to the records it was the second typhoon to strike in the space of two weeks. Early surveyors had noted coral boulders thrown high on the beaches by storms and evidence that large areas of the atoll had been submerged in the past. In the fall of 1941 Wake’s civilian and military personnel endured pounding storms that tore at new structures, clogged the channel, disrupted air and sea traffic, and threatened life and limb. The predicted typhoon strength winds veered off and these Wake Islanders breathed sighs of relief, but eyes scanned the surf and sky and their own narrow, flat purchase with a heightened sense of their precarious vulnerability that would only be eclipsed by the enemy attacks around the corner. In the postwar years, typhoons have been tracked, measured and named. Storm surges come and go, wreaking havoc as they inundate ground-level structures before receding, but anticipated tsunami waves pass on by (Wake’s “slender stem” has little underwater land mass for a wave to build upon.) On September 16, 1952, Typhoon Olive destroyed or damaged 90 percent of Wake’s structures with 150-mph winds. With $10 million rehabilitation, much was rebuilt during the 1950s and 60s. Almost exactly fifteen years after Olive, Typhoon Sarah smashed Wake in September 1967 with winds estimated at 130 knots before recording equipment was damaged. This time some 95 percent of structures fell to the storm while a quarter of the population was evacuated. Wake rebuilt again (these decades were Wake’s heyday). In March 1981 Typhoon Freda hit the atoll, destroying a $7 million sea wall and cutting the airstrip to a half mile. Most recently Super-Typhoon Ioke struck on August 31, 2006. Winds clocked at 150-mph damaged some 70 percent of the buildings, though major infrastructure survived, including the airfield. The entire population of 188 was evacuated by air. Damage was estimated at $80 million and, as I observed in 2011, some structural damage is still evident. Long story short, wherever you are, be prepared, beware. Tick tock.